Are you looking for a new recipe to use your summer zucchini? This bread is easy to whip up and is on the healthier spectrum of zucchini breads. The bread is made with whole wheat flour, Greek yogurt, and coconut oil. There is no butter in this bread! Don’t worry, you won’t miss it. The coconut oil gives the bread an incredible flavor. The Chocolate Coconut Zucchini loaf is also super moist thanks to the squash and Greek yogurt which is surprising with how think the batter appears in the mixing bowl. The shredded coconut compliments the zucchini nicely and adds a little extra coconut goodness to the loaf. We added 1/2 cup of dark chocolate chips for an extra tasty treat. A delicious loaf sweetened with coconut. Preheat the oven to 350 degrees F. Grease a 9x5 inch loaf pan and set aside. In a large bowl, whisk together flours, baking soda, baking powder, salt, cinnamon, and nutmeg. Set aside. In a separate large bowl, combine shredded zucchini, sugars, coconut oil, yogurt, egg, and vanilla extract. Add the wet ingredients to the dry ingredients and stir until moistened. Stir in the shredded coconut. Pour the batter into prepared pan. Bake for 50-60 minutes, or until a toothpick inserted into the center comes out clean. Let zucchini bread cool in pan for 10 minutes. Carefully remove the bread from the pan and cool completely before slicing. Add in: For a tasty twist add in 1/2 cup of dark chocolate chips. I am always on the lookout for new recipes! What is your favorite Zucchini recipe? I’ve been craving zucchini bread and just happened across your recipe on Pinterest. And, yesterday was the first day I ever baked with coconut oil – made terrific chocolate chip oatmeal cookies. So, that means I have the coconut oil, the chips, the coconut, well, you get it, I’m almost on my way to making this. Thanks for sharing, I wish it was in the oven right now! That sounds interesting! I don’t care for zucchini but with chocolate, everything is good!! I just made homemade Chocolate Zucchini bread the other day for the first time ever by myself. AND the whole family LOVED it. I was extremely proud of myself. Now I want to try this. Coconut is one of my hubby’s favorites. I just put two loaves of zucchini bread in the oven! Mine have chopped pecans and crushed pineapple and raisins in it…but, next time around I’m going to try your version! Coconut and chocolate chips sound like a great combo! I’m making a batch Monday so the kids have a yummy treat in their lunches. Oh yum. Thanks for sharing as this looks so good! I am going to add this to my list of must make items. This sounds like an easy one to make and ultra tasty!!! I’ve been meaning to try a dessert with zucchini. This sounds amazing. 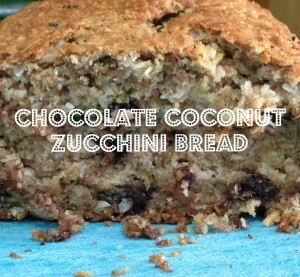 I’m not too big a fan of zucchini but the kids are and with coconut I’m sure this tastes really good. Thanks for the recipe. This sounds amazing and what a great way for kids to eat their veggies too! Love the mix up of ingredients on an old favorite, my daughter loves coconut so know she willlove this. I never heard of a recipe anything like this before! It really sounds interesting and creative. I have never tried zucchini. I will have to try making this recipe to give it a try. This sounds interesting, I have never thought of combining zucchini and coconut. The recipe sounds delicious! I love coconut and I love that I can rationalize this as a healthy snack because of the zucchini! Love that it has coconut oil and greek yogurt definitely going to try! I love zucchini bread and I love coconut. So I think this would be something I could sit down and enjoy with some coffee! That sounds absolutely wonderful!! I would love to make this sometime soon! !